To Cite: Bagherifard A, Yahyazadeh H, Jafari D, Shoushtarizadeh T. Ewing’s Sarcoma of the Finger: A Rare Case Report and Review of the Literature, Shafa Ortho J. Online ahead of Print ; 1(1):e51. Abstract: Ewing’s sarcoma is a malignant small cell neoplasm of long bones and pelvis during the first or second decades of life. The involvement of phalangeal bones is extremely rare. We report a Ewing’s sarcoma of proximal phalanx of the second finger of a young man. Ewing’s sarcoma usually affects the long bones in young patients and accordingly is the second most frequent primary malignant bone tumor after osteosarcoma. The involvement of phalangeal bones is extremely rare (1, 2). We report a Ewing’s sarcoma of proximal phalanx of the second finger in a young man, its presentation, clinical course and treatment. A 25-year old right-hand-dominant man referred to our hand clinic because of pain and swelling in his left hand since 5 months ago. There was no disease or trauma in his past medical history. In physical examination of left hand we noticed a fixed firm swelling in proximal of second finger. The swelling was painful in palpation and with prominent dilated superficial veins on it (Figure 1). 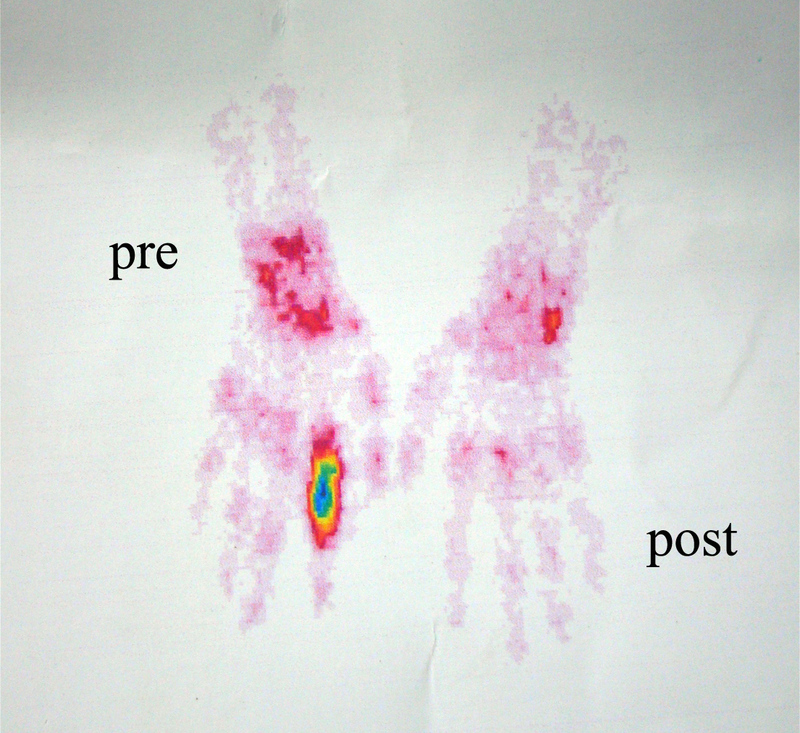 A decrease in range of motion in metacarpophalangeal and proximal interphalangeal joints was observed but the site was painless. Other physical examinations were normal. 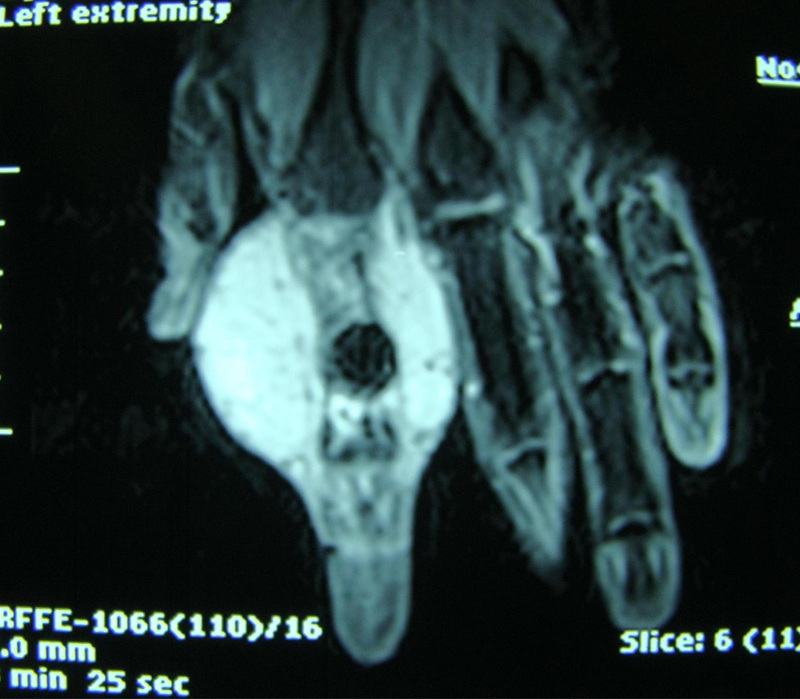 Radiography of left hand revealed proximal phalanx of index finger involvement by destructive lytic tumor (Figure 2). Routine lab tests were normal. Chest radiography was also normal. 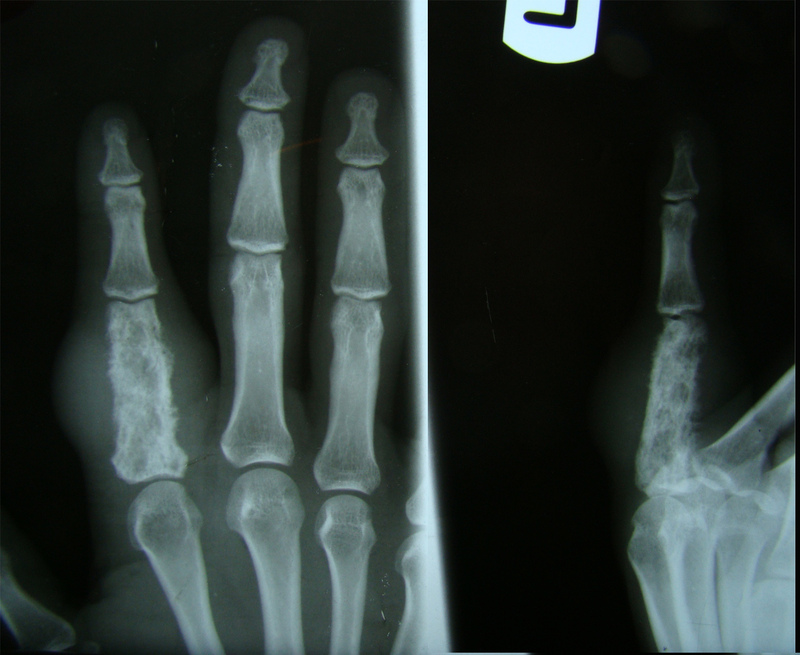 Whole body bone scan showed increased uptake of left index finger without involvement of other areas (Figure 3). The MRI revealed proximal phalanx involvement with tumor invasion to soft tissue (Figure 4). Incisional biopsy was performed and pathological examination revealed homogeneous population of densely packed small round cells with diagnosis of Ewing’s sarcoma (Figure 5). After consultation, a second ray amputation and then chemotherapy were performed. The patient was followed for 25 months and no sign or symptom of tumor recurrence was observed after surgery. Ewing’s sarcoma was first described in 1921. It is a malignant small cell neoplasm of long bones and pelvis during the first or second decades of life (3). When the Ewing’s sarcoma develops in hand, the metacarpal followed by proximal phalangeal bones are the most involved locations (4). 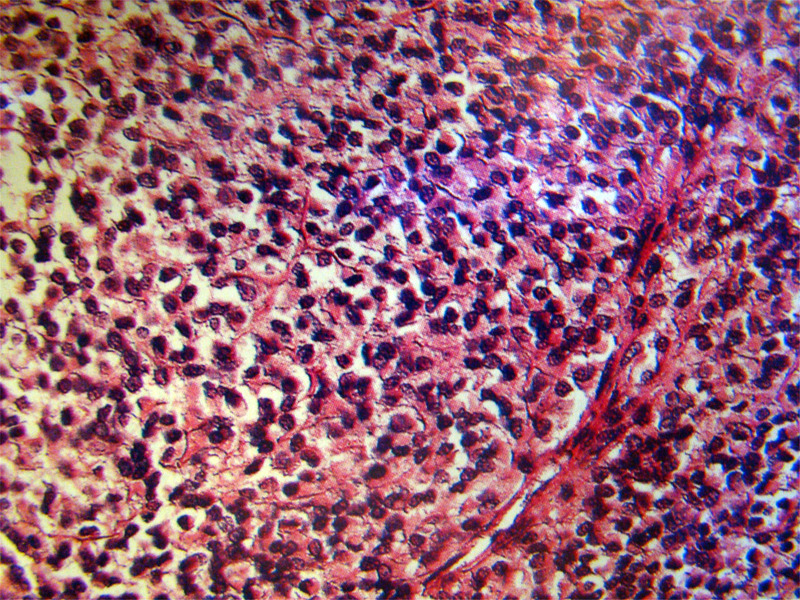 Ewing’s sarcoma rarely may originate from soft tissue. It involves males more than females. A reciprocal translocation between chromosomes 11 and 22 is positive in most of cases with Ewing’s sarcoma (11; 22) (q24; q12). According to the literature and similar to our case, pain and swelling of the involved fingers were the most frequent complaints at diagnosis. Fever, leukocytosis, elevated sedimentation rate were also among the most common symptoms. To assist diagnosis, plain radiography, CT scan, and MRI are helpful. Radiographic characters of Ewing’s sarcoma in small tubular bones of the hand may differ in classic patterns of pure permeative lytic lesion. On imaging, features of Ewing’s sarcoma of hand include expansile lesion or bony expansion, honeycomb pattern and lack of periosteal reaction (5). Treatment options for Ewing’s sarcoma in fingers have been controversial during the recent decades. However, the most accepted procedure has been amputation or wide surgical resection followed by chemotherapy. Review of the literature revealed that Ewing’s sarcoma rarely involves phalangeal bones but nevertheless Ewing’s sarcoma should be included in differential diagnosis of lytic lesions in small tubular bones of hand. This lesion is very similar to osteomyelitis in clinical and imaging presentation and the rarity of the tumor may mislead the diagnosis (5).